The portable wsjt-x device in pocket is now named. As the title says, it's simply called Wsjtx-Portable. 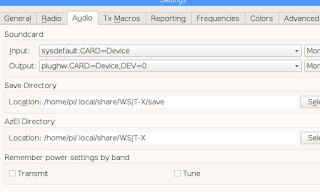 Wsjtx-Portable is a Wsjt-X program-only device in pocket. 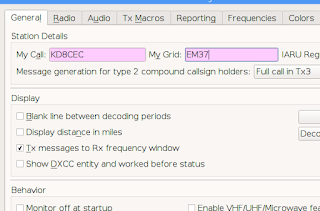 I wanted to make it available for use in SOTA, qrp, automobiles and outdoor. Caution : Wsjtx-Portable should have experience using wsjtx. used this great program, please install it for PC first. Once you are familiar with how to use wsjtx, we recommend using Wsjtx-Portable. This is because using a small size LCD is more inconvenient than a PC program. 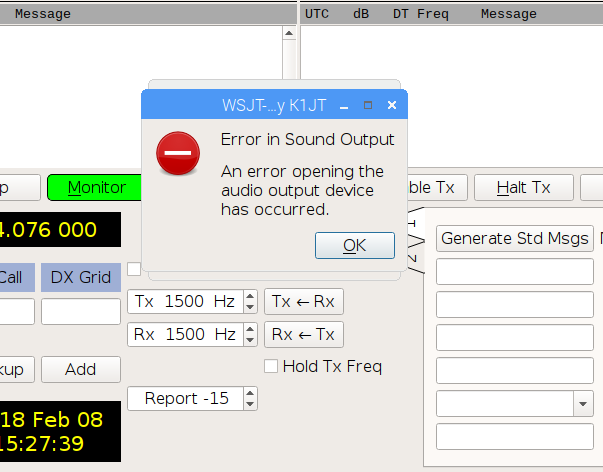 The following link explains why created WSJTX-Portable. 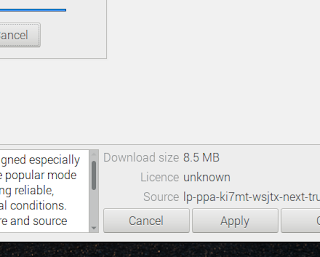 Why did you set the version to 0.5? It is not finished yet. Wsjtx-Portable will continue to improve. Are you ready for funny digital communication? I will suggest two ways. The hard way and the easiest way. The hard way is to follow the settings one by one. 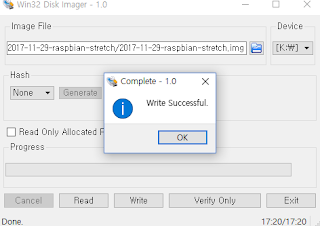 The easiest way is to write the image I uploaded to the sdcard. Both methods are good. 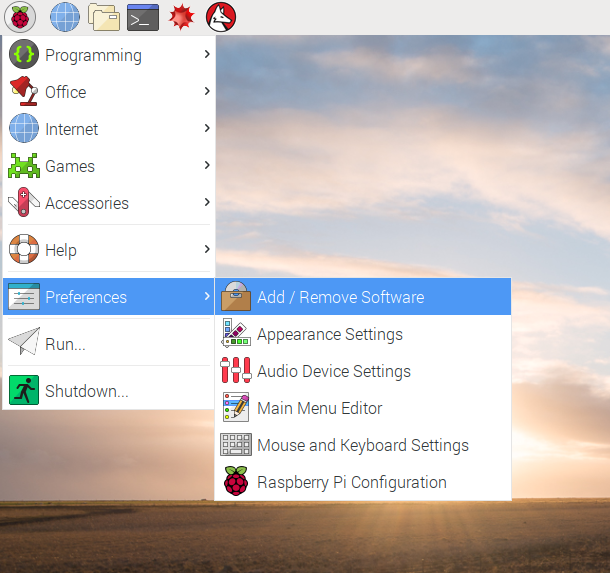 Raspberry Pi 2 is also available. 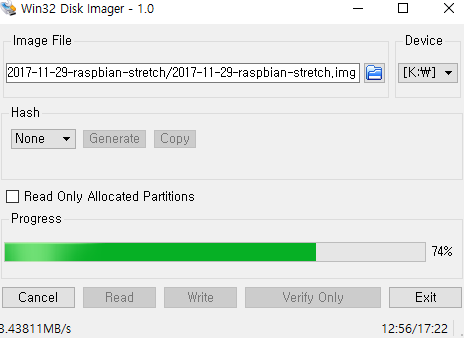 but slow, i recommend Raspberry pi 3. 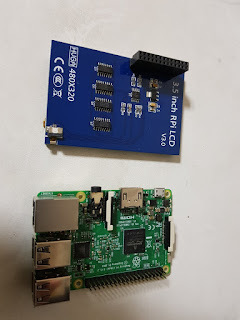 I used RPI3 and RPI2 because I had quite a lot of Raspberry pi 2 that I used in my graduate lectures. I tested two 3.5 LCDs and confirmed that they all work. If you have a different model, I would be grateful if you can experiment and let me know if it works. I had two 3.5LCDs, but fortunately it all worked. But the up and down has changed, but it does not matter much. 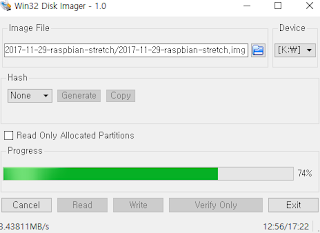 If you choose the second installation (easy) of the two installation methods, 16Gb is recommended. 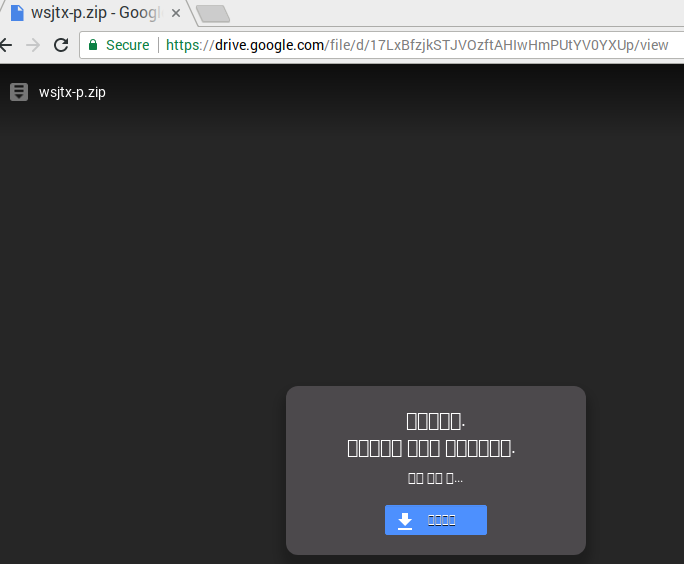 I create an image using an 8GB SD card. Even the same 8Gb SD card is slightly different in size. 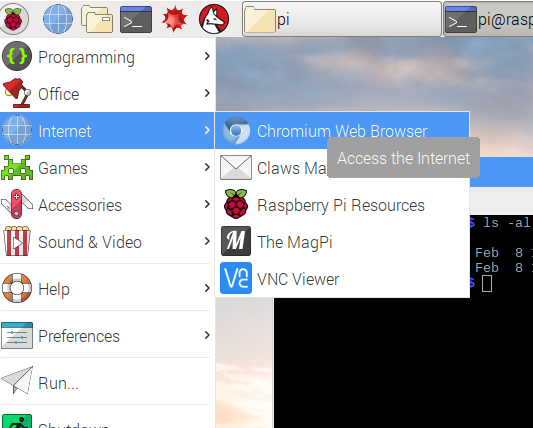 Anything that is available in Raspberry Pi is good. Use for installation only. You do not have to buy a new one. *There are two ways to install. If you want to install one by one, please read 2. 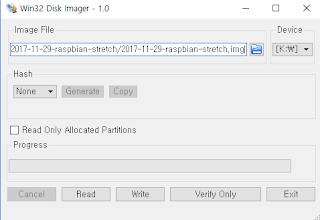 Read 3 for quick and easy installation. Click on the link below to install Raspberry pi. I also open the link above and follow. The images below are the pictures I took during the installation. LCD is not yet mounted. 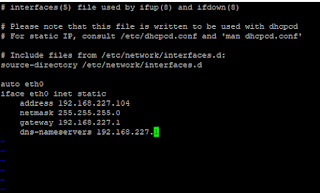 IP Setup -Set the ip you want. 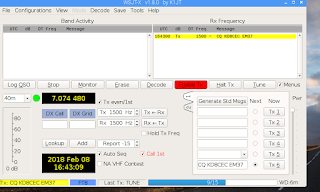 Install Wsjt-X by referring to the link below. 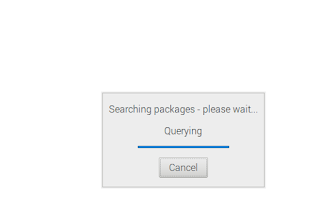 I also refer to the link above to proceed with the installation. I only install Wsjt-X for quick installation. 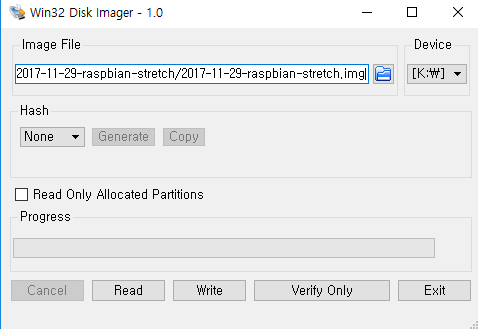 If one of the above procedures is incorrect, the version will be 1.1 or 1.0. 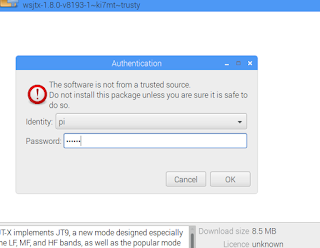 If you do not have a version starting with 1.8, do not install it. 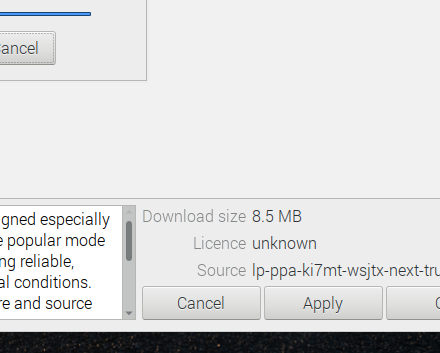 When all the installation is complete, click the OK button. Install the LCD 3.5 driver you have purchased. The following procedure may not be compatible with your LCD. All LCD driver installation is finished. Simple, right? Now we will try switch to 3.5 LCD screen. 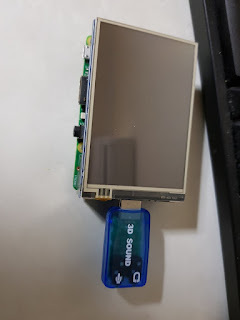 After a while, the LCD should display as below. If the screen below does not appear, you need to find the driver for your LCD. If the test is successful, switch to HDMI mode again. If you have switched to the LCD 3.5 screen, press and hold the touch screen on the LCD. The menu should appear as the right button is pressed as shown below. 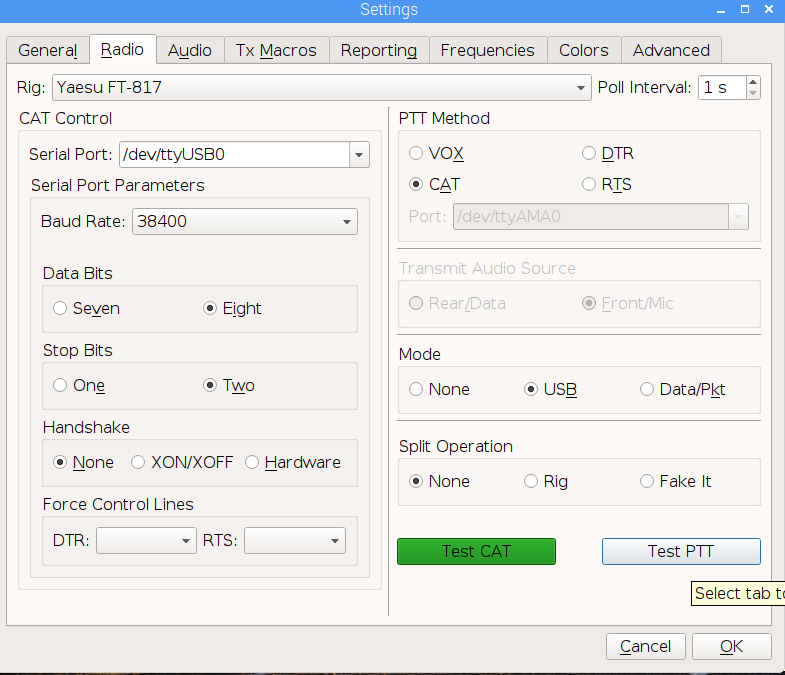 This function is essential when you go outdoors with Wjstx-Portable. Switch the screen back to HDMI mode. Shutdown and Connect sound card, CAT Communication cable, and booting. The wsjtx setting can be found on the Internet. If you are using uBITX, you can refer to the link below. 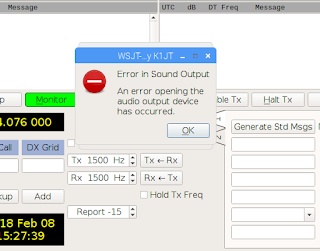 After completing the wsjt-x setup, finish the test until communication is possible. Below is an example of my setup. 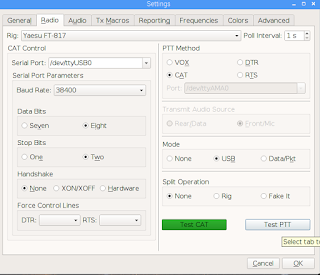 Make your own settings because the situation of your radio, sound card, etc. is different. 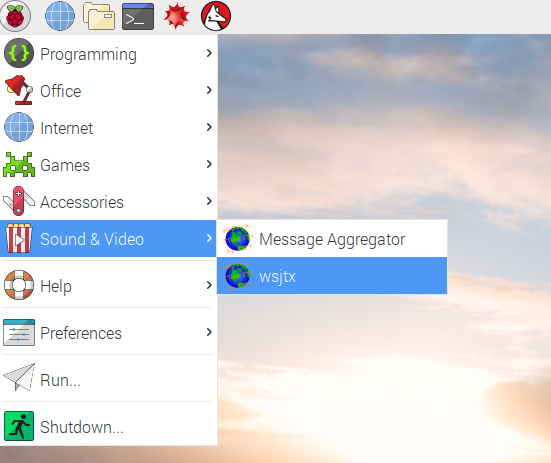 When you first install the wsjt-x program, the Splash window appears. Splash Windows can not be closed on a small LCD 3.5. Of course, if you wait quite a long time, it disappears by itself. 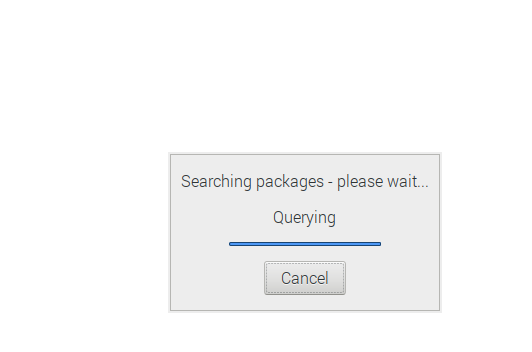 Read the Splash Windows and check the Checkbox at the bottom to prevent it from reopening. 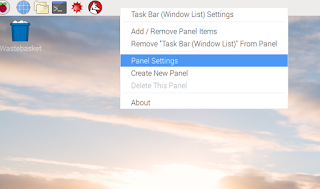 I thought it was polite to keep Splash Windows. 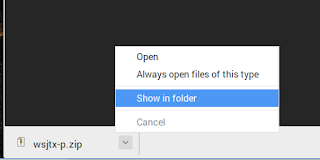 you can saw this files. 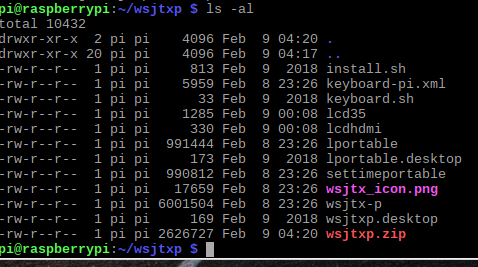 I have created a script that copies the files needed to run Wsjtx-Portable to a directory. If you want to copy manually, open the script by text editor. You can see where the files should be located. 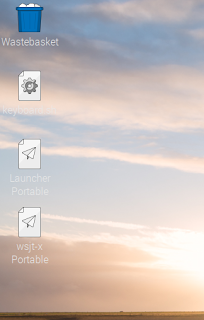 If the script is successful, you can see that the icon is created on the desktop as shown below. Here is an option. Just follow the person you want. 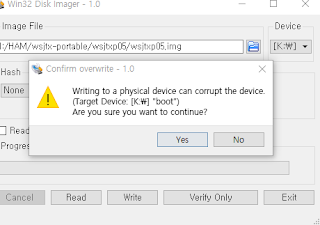 The video below is Wsjtx-Portable, which I installation while posting this article. Congratulations. All the installation process is complete. 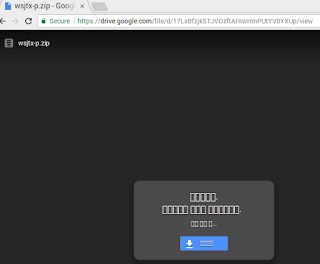 I knew I could not download it later. 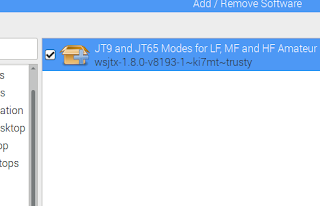 So I temporarily uploaded wsjtx portable image file on my server. 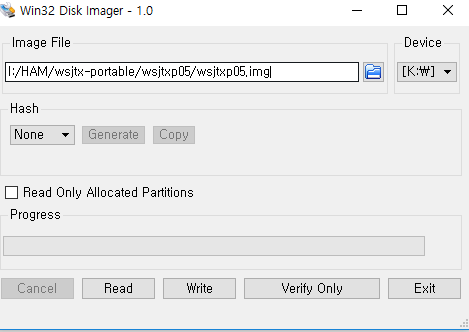 Use win32DiskImager to copy Img to the sd card. 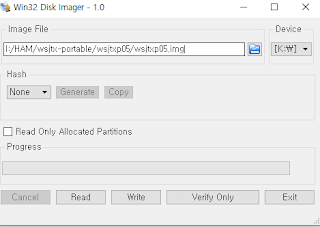 win32DiskImager can be downloaded by clicking the link below. 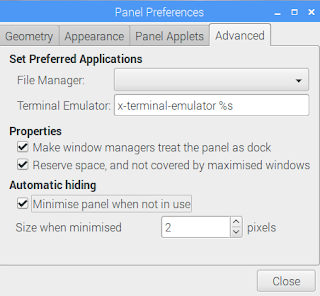 You can see how to use Win32DiskImager in the link below. This step is for setting wsjtx on the big screen. 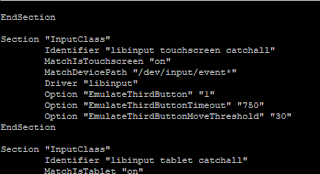 I've put virtual keyboard and mouse right button functions in Image. 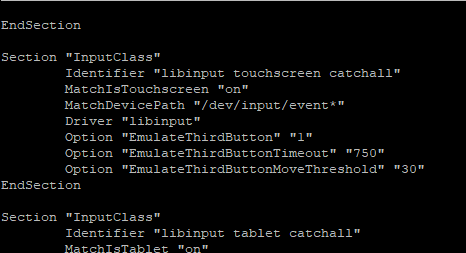 so You can use them to configure on 3.5LCD. However, it is not recommended. I'm uncomfortable with the small screen. Just use it as an emergency at outdoors. Sometimes I set it up to 3.5 LCD because it is annoying to connect the keyboard and monitor to the RPI at home. 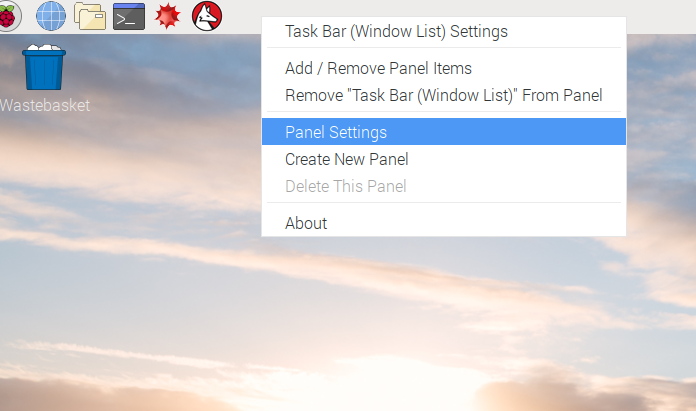 If you like to touch a small screen, you can skip this step and the next step. 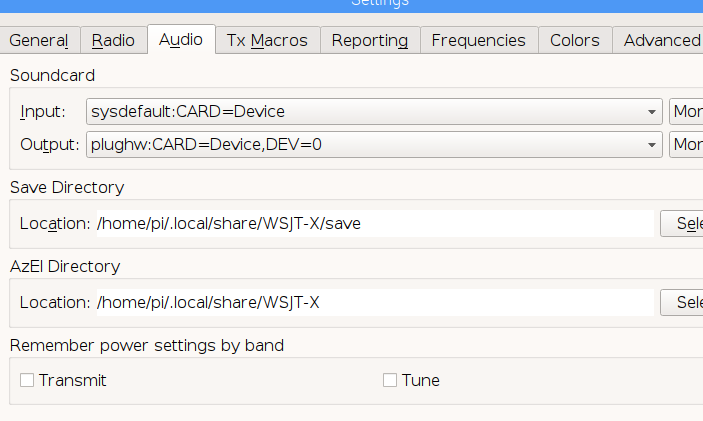 You can also make settings in the Configuration menu of Wjstx-Portable. Please watch the video below. 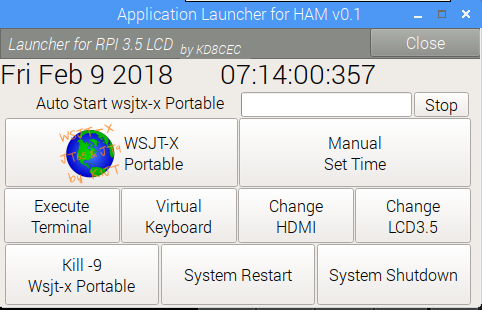 The first time you turn the power on, it boots and automatically launches Launcher Portable for Ham. Press Stop before Wstx-Portable is executed. Press the Change HDMI button. After a while the Launcher Portable will appear on the HDMI monitor. 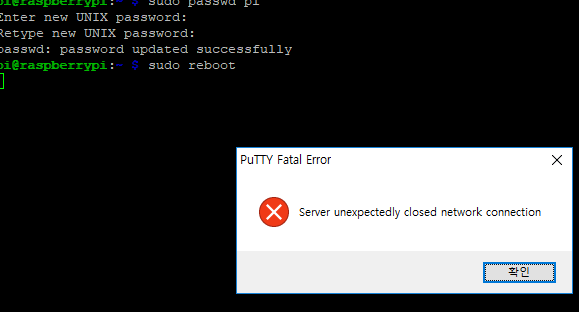 Press Stop Button and then press close button. I recommend that you complete the communication test. 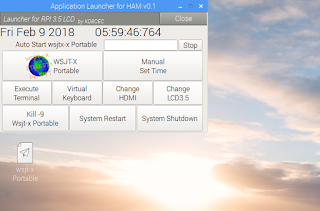 Once you have configured and tested Wsjtx, run Launcher Portable. Click the Change LCD3.5 button. You can see Launcher Portable running on 3.5LCD and Wsjtx-Portable running after a while. 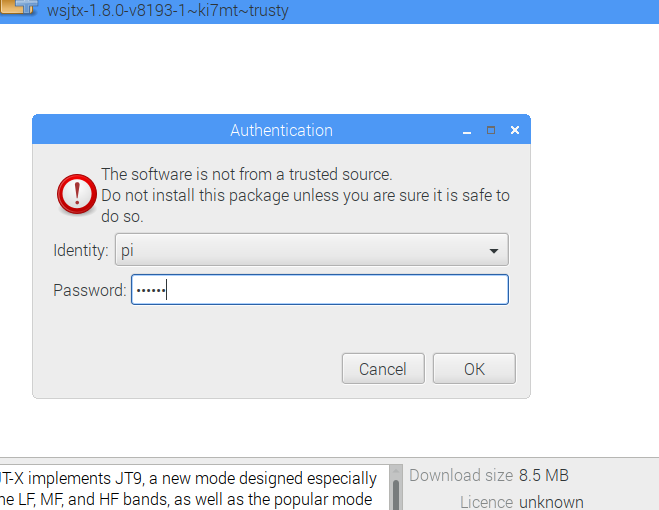 You have completed your own Wsjtx-Portable according to Installation Method 2 or Installation Method 3. 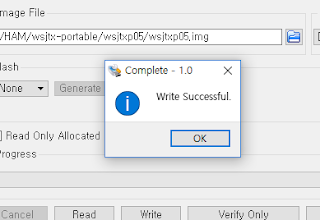 Wsjtx-Portable was created earlier, but it seems that it took more time to create this document. 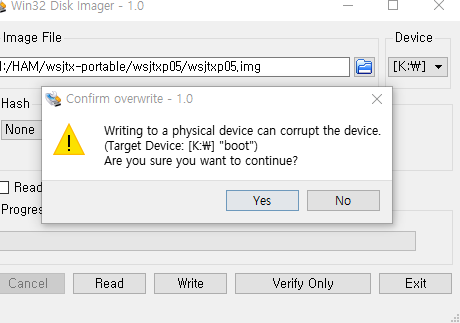 After a little rest, I will post the Wsjtx-Portable manual. It is also recommended to try beforehand. If there is a problem, just copy Imgage again. I hope your new 3.5LCD will arrive quickly. I watched the picture later. It is so cool. If you have time, I would like to see more pictures. Would a 5” LCD work as well? What modifications would need to br made for this to work? 3.5” is such a small screen. Thanks! The 5 "LCD was not in the plan early on. But I have decided to make 5 "Wsjtx-Portable for my needs with many users. 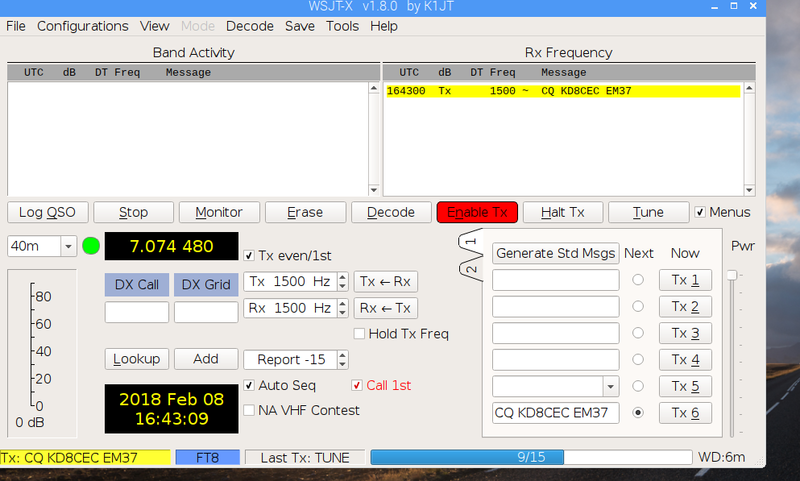 But as you can see, the full version of Wsjt-x 1.9 is coming soon. So I'm hold for the Wsjtx-Portable project for a while. 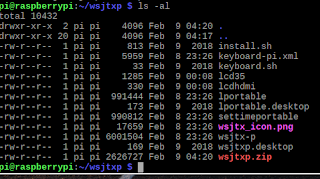 When version 1.9 is released, I want to make Wsjtx-Portable a new version. At that time, I expect to make a 5 "LCD version. 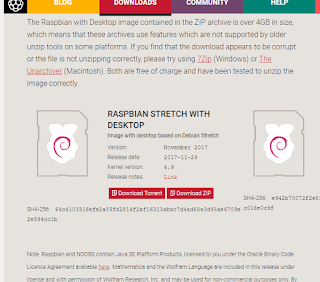 What's the admin password of raspbian in the img image? 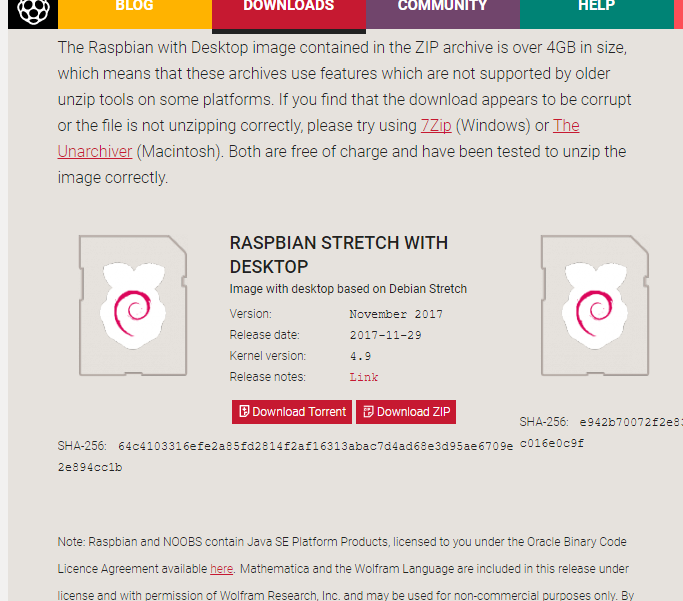 E: The repository 'http://ppa.launchpad.net/ki7mt/wsjtx-next/ubuntu trusty InRelease' is not signed. First of all... Thank you for all your work related to the uBitx. Hi Ian. Thanks for making WSJTX portable. 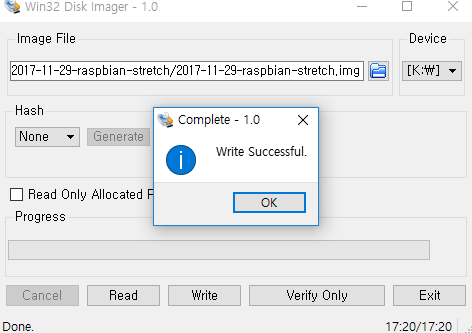 Your image (WSJTXP 05.zip) would not load on my RPI3 that uses the official RPI display so I followed your step by step instructions above and it is all loaded and works (including WSJTX 1.9.x that loads from the KI7MT PPA). But the top of WSJTX and the Waterfall are above the top edge of the display so I can't move them. 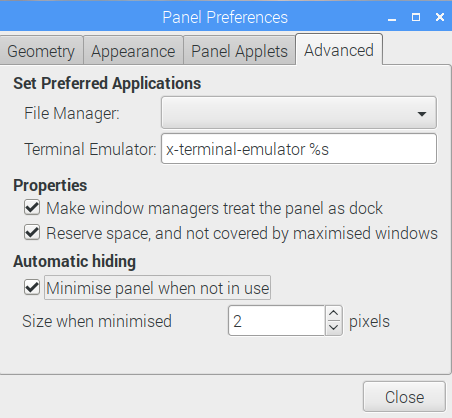 How do I access the top of the windows to reposition them on the display?? Ian, the image I built with Raspian Stretch and WSJTX 1.9.0 rc4 from the KI7MT PPA runs great on the RPI3 B+. 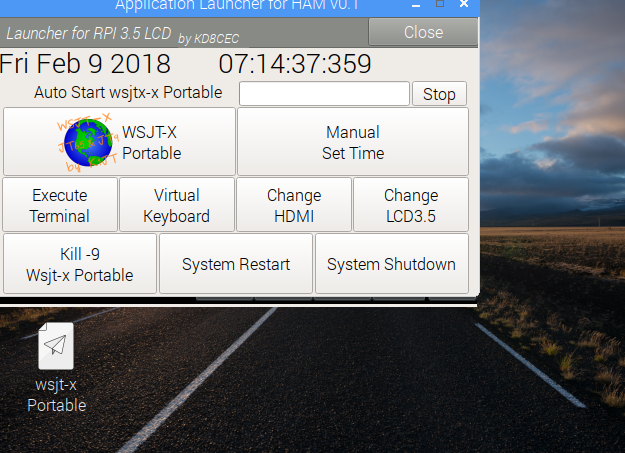 I found the upper edge of the waterfall and wsjtx display screens but WSJTX is still fixed in location in the upper left corner of a regular HDMI monitor as it is on the RPI display above. I presume this is for the original 3.5" display. 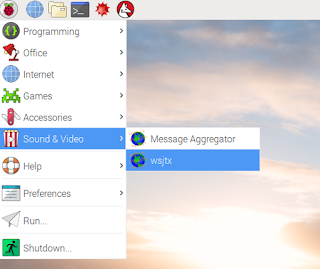 Can the wsjtx windows be made moveable for a larger display? 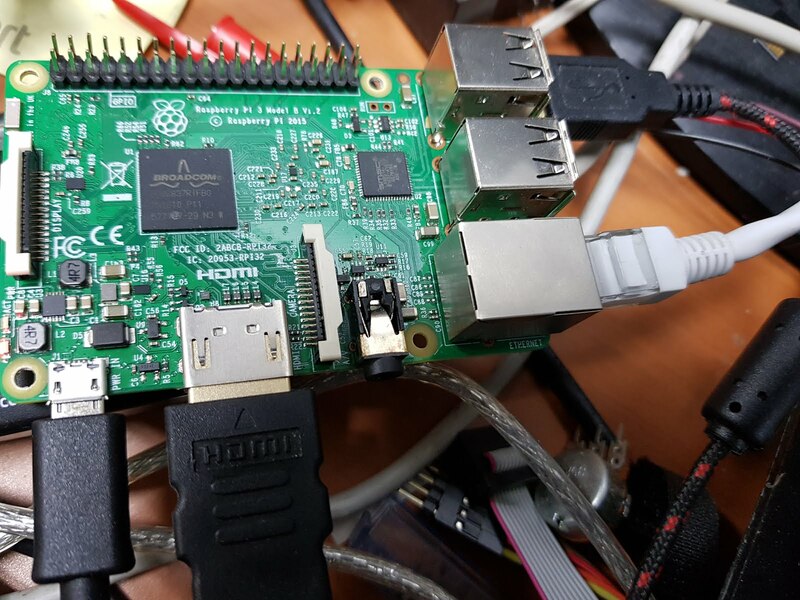 Ian, just got a Raspberry Pi 3 Model B and plan on using it with my uBitx. 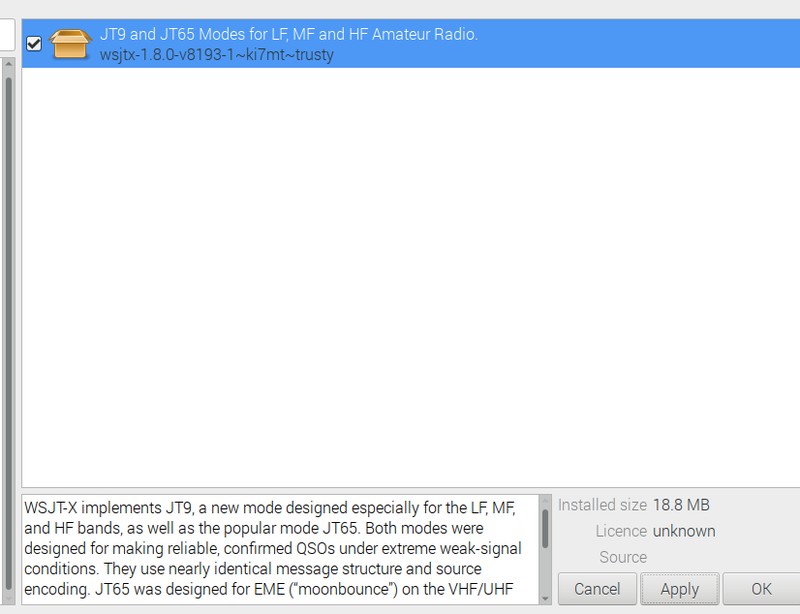 Is there a final version or updated version of your FT8 software?? 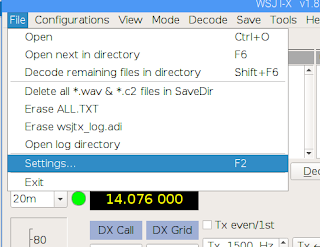 Anything special that I need to do, I am familiar with FT8, run it all the time with my Yaesu FT757gx on my laptop. 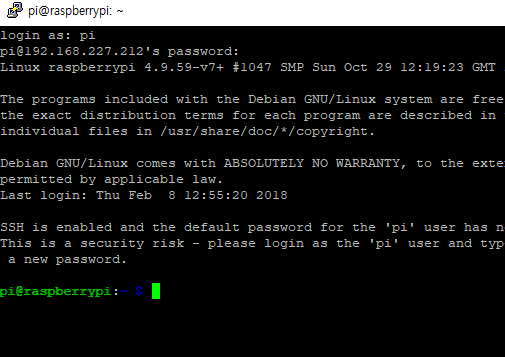 Right now I am using my Raspberry Pi as I am typing this. 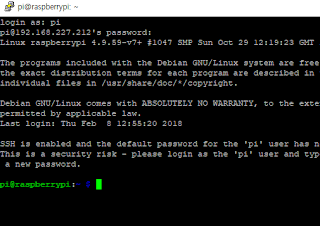 I have upgraded the firmware to the most current for the Raspberry. I have purchased the USB Soundcard and I am waiting for my 3.5 LCD screen to come in. Right now the Raspberry is hooked via HDMI to my TV screen. Thanks again for all this great stuff you are doing with the uBitx and now I see Raspberry stuff as well. 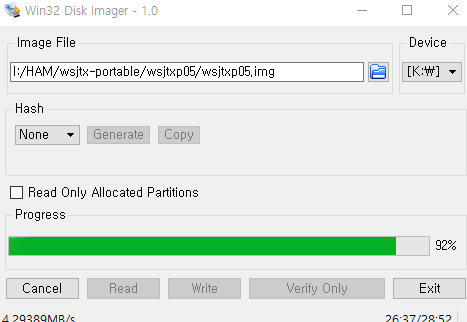 I download wsjtxp05.zip img and clone to my sd card, but I try all night still can't into the OS. 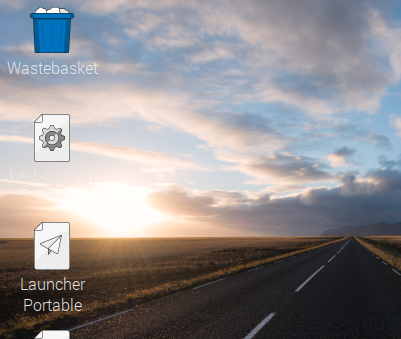 it's always Stop to OS begin color screen(no any text). my setup is 3B+ and 3.5" LCD and 8G(16G) sd card.even I take off 3.5" LCD, still can't be. 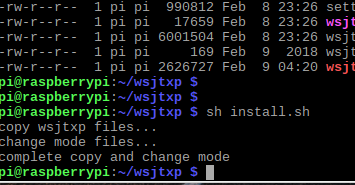 I download wsjtxp05.zip img and clone to my sd card. 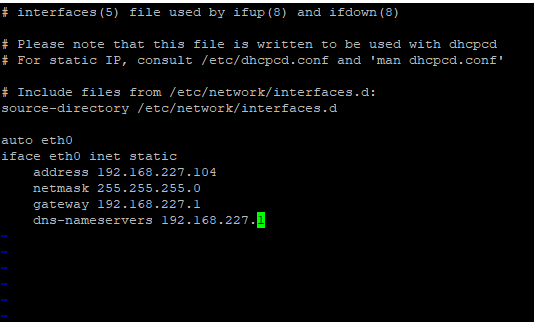 Got it working fine with my MCHF V.7. 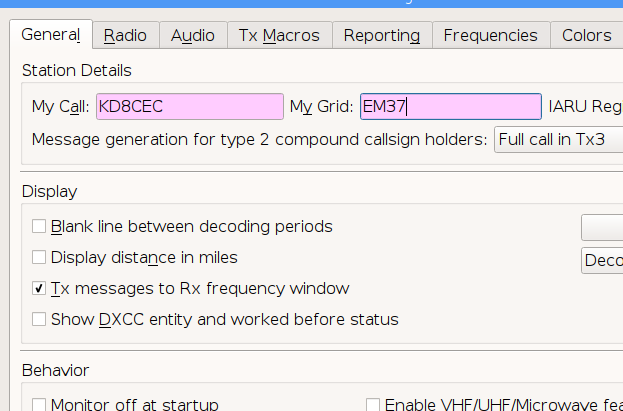 But soon the FT8 format is changing. 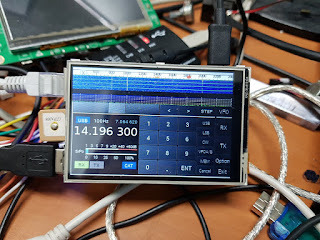 Will you be doing portable version of WSJT-X2.0. I appreciate the publication of a wonderful project. I tried portable as well. 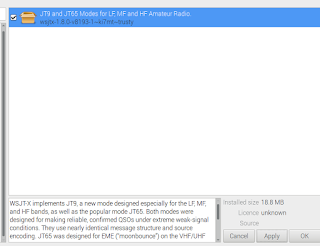 It is regrettable that it does not correspond to the transmission of the new FT 8. Please correspond to 2.0.0 if there are opportunities in the future. Here I can see my work.